The common coconut, the fruit of the coconut tree, is actually a nut (looking at the word “coconut,” I guess that shouldn’t be too surprising, but we have a history of bestowing the name “nut” on non-nuts, so I thought I should clarify). It is edible in all stages of development, but the meat changes as it ages. 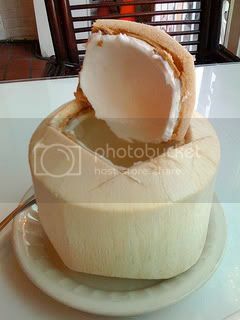 In the younger, greener years, the coconut meat is soft, almost gelatin-like – enough so to earn the moniker “coconut jelly.” This is when the coconut water is the sweetest; as it ages, the water can get a bit bitter. Older coconuts – the hairy ones – are incredibly tough to crack, but the meat is dense, slightly sweet, and perfect for shredding or cooking. Coconut meat is high in healthy saturated fat, with decent amounts of protein and a low glycemic index. A cup of shredded, raw coconut meat contains 27 grams of fat, mostly saturated; 3 grams of protein; and 12 grams of carbohydrates, mostly fiber. It can also be dried and ground into coconut flour, which can effectively replace traditional flours for Primal baking or sauce thickening (much like other popular nut flours). 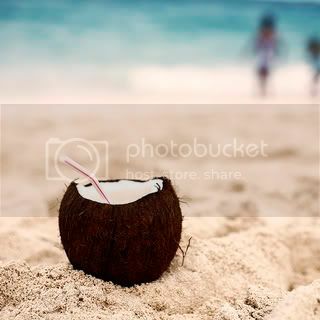 Another delicious aspect of the coconut is the water. Coconut water (not to be confused with coconut milk, which is actually manmade – see below for a recipe) is that liquid you hear sloshing around inside. As I said earlier, the younger coconuts will have sweeter water, so go for those. Of course, you could just buy the pre-drained coconut water, but I think cracking your own coconut and draining it yourself is much more enjoyable (and Primal). Coconut water has natural electrolytes (potassium and other minerals), making it an effective (albeit expensive) sports drink. It also just tastes great, and isn’t that reason enough to drink it? But coconut oil is perhaps the greatest Primal food obtained from the coconut. 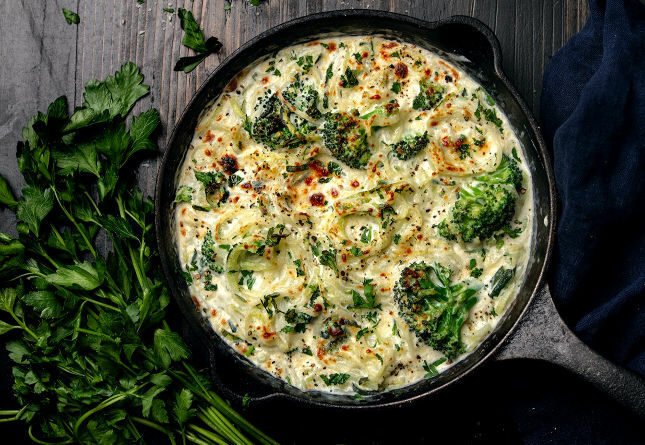 It’s good for moderately low-heat cooking, or you could just eat it with a spoon for a serving of healthy fat. In a previous post, coconut oil figured prominently in our recipe for Primal Energy Bars. It’s a great binder, especially for nut and fruit bars. I guess you could technically use olive oil, but that just doesn’t sound very appetizing. Oh, and with coconut oil, you’ll want to get the unrefined variety (in true Primal fashion). Keep coconut oil at room temperature, and don’t let it get too hot or too cold. Most coconuts you come across will likely be in an air-conditioned produce section, so the quality and freshness are mostly assured. Still, you want to pick the very best nuts possible. It’s not all that complicated an elimination process, to be honest: pick the heaviest coconuts that slosh the most, and watch out for soft spots. And obviously you’ll want to avoid any blatant discolorations. This is arguably the best part. Opening a coconut is good, honest work, and it should unlock your inner hunter-gatherer. Young coconuts go pretty easily. All you need is a large, sharp knife (like a cleaver, or a machete, or a large chef’s knife). As you’ll see in the video below, the tops of most young store-bought coconuts are triangular points with the hard green shell already removed, making it easy to hack off. Mature coconuts are hard and hairy. You may want to drain the mature coconut before opening it – do so by locating the three “eyes” of the coconut, and then driving a nail or screwdriver through the soft one. After the liquid is drained, find the equator. There should be a small, but apparent seam running between the “eyes.” Hit a blunt object (hammer or heavy dull side of a knife) along the seam, and it should crack open. 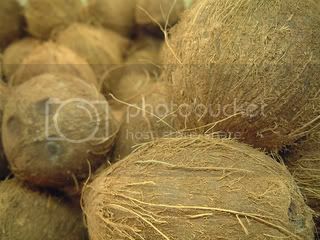 Another method is to put the coconut in a durable bag and crush it with a large rock or hammer. Or, you could treat it like a modified Primal workout and slam it repeatedly against the ground. Either way, the coconut flesh is actually more easily obtainable in tiny pieces. To get the meat, pry it off with a butter knife. Okay, you’ve got your hands on some fresh coconut. What now? Pour water over coconut shavings. Let sit for five minutes, and then puree the mixture in a blender. Strain the puree through a cheesecloth or strainer, making sure to squeeze out as much liquid as possible. For thicker milk, use less water. Use the milk in any recipe that calls for it, or just drink it straight. Enjoy. This incredibly easy pudding recipe is best served hot and fresh. Stir yolk, flour, and honey/syrup together to form a paste. Using a small pan, heat it over medium heat for one minute. Add the milk and turn the heat up. Once it starts boiling, stir continuously to get all the lumps out. Once it’s smooth, turn off the heat and serve. A few berries, nuts, or banana slices go well with this. Maybe add a drop or two of vanilla, or even a pinch of cinnamon. It’s all too often that we forgo Thai food because rice, noodles, and peanuts figure so prominently in the cuisine. This soup recipe is Primal while retaining the Thai essence. In a medium saucepan, combine broth, chiles, garlic, ginger, zest, lime juice, and 3 tablespoons of fish sauce and season with salt. Bring to a simmer and add mushrooms. After three minutes of simmering, add the meat and coconut milk. Cook the meat through, then add the spinach, letting it simmer until the spinach wilts. Add the cilantro and the remaining fish sauce. Serve and enjoy. What about you, readers? Any great recipe ideas? Hmm, that looks like quite a fun time. I’ve never found coconut milk to agree with me for some reason, though coconut oil is absolutely delicious! Putting it on crackers has been a guilty pleasure in the past, though I like to think I’ve given that up. That recipe sounds great, and I can imagine it would be great with tempeh (yup, that would be the remaining vegetarian bias shining through). Thanks for these great tips and recipes. Sometimes when i want to eat coconut, i’ll mix a little with 1/2 banana, and a few chunks of pineapple. I never knew how to pick a coconut, thanks for this great tip. The Thai Coconut Soup sounds great. In the city i live we actually have 1 “Thai Crusine” Rest. I’ve never been there, but this soup sounds delicious!!! I’m glad to see how the tide has turned for the coconut — I never believed something so good could be so bad. And then there’s my tai chi teacher’s stunt for opening a coconut. I am a big coconut fan. Guilty, if anything, of overconsumption. Without going into the gory details, I have some evidence that if you too mcuh coconut oil or cream, it may not fully digest! I buy solid blocks of coconut ‘cream’ which is often sold at West Indian shops and is a highly concentrated form with a lot of the solids, but not all, taken out. Very more-ish if you eat it, but also a very easy way to cook, because grating small amounts into food has a big effect. I am convinced that with eggs, nuts, this solid coconut cream, and a fruit like banana, it would be possible to make a dynamite cheesecake. I just don’t know how to get from A to B…. Awesome post mark! I did an article on coconut a while back that your readers will probably enjoy as it compliments this one nicely…. I love coconut soup and your recipe will be something on my to do list this weekend! Ah yes, I love the coconut. I crack a fresh one open every now and then. It is a lot of work but it is fun and feels very primal. I also have a shot of coconut milk almost every day. I like the taste and I can feel my body heat up like a furnace (Maybe it increases my metabolism?). I also like cooking with coconut oil and using coconut oil and shredded coconut in my primal energy bars. We also like doing coconut milk and shredded coconut with shrimp yum yum. 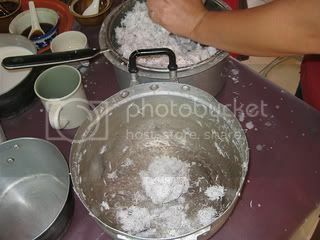 With my in-laws all being thai or phillipino, coconut is a food that we can all agree on too for get-togethers. I like cutting up some fruit, like strawberries or just some grapes and putting a big tsp of cocnut oil on top and then just toss gently. My favorite coconut story took place in Vietnam – a local townsman climbed up the tree, dropped the coconuts to the ground, took a mashete-looking knife, whacked off the tops and stuck straws in for us to drink the right out of the fresh coconut. It was delicious…..
Coconut rocks my socks! I am convinced that it is a total superfood. It makes me so grumpy to think that I avoided coconut for so many years because I was duped into thinking it was bad for me!! I’m reminded of Mary Anne’s coconut cream pies on Gilligan’s Island. (Gilligan’s favorite!) And remember when the Professor made a lie detector out of coconut shells? Hey Mark – I am from a coconut country, kerala, southern state of India. We have been told that coconut is not so good for health – and I am glad to know it is a primal thing. BTW, climbing up the coconut tree and plucking it also is very primal stuff. There is also another technique in getting the water out of the coconut, you bang it on the middle of the coconut with a heavy knife or on the ground. You can peal the coconut meat easier when it opens up. 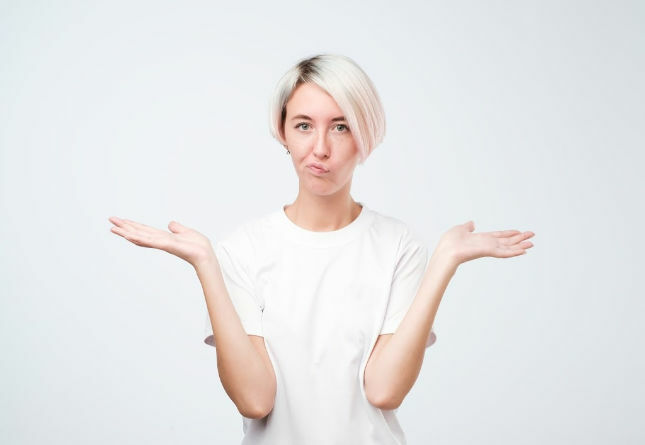 Coconut, coconut oil, coconut cream – healthy?! What the? 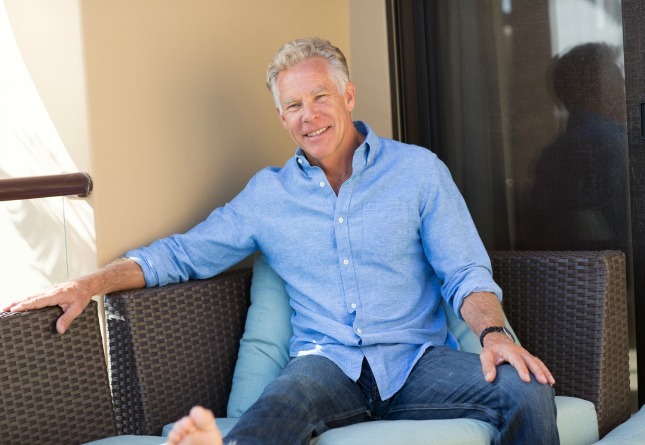 Mark I loved this article, it is so great to see some honest information on the field of nutrition, something that is not tainted by the influential power of the food companies. I have been advising my clients/readers on the importance of good fats for years now (although, no, I wasn’t always so well-informed, thank-you grain industry) but most people out there still think that means a sliver of avocado and a dash of olive oil now and then. Maybe the occasional Omega-3. While all this stuff is great, nature has provided us with many healthy fat options that many of us in the Western world are only just coming round on. Coconut products are one such food. Since adding coconut oil to my diet I’ve had better energy and digestion, improved performance (in the gym! ), and have definitely managed my weight with greater ease. Keep up the real writing Mark! The coconut pudding sounds awesome! I’m definitely going to give that a try! Not only for healthy food, coconut tree also now as green material. I developed and produce coconut flooring (hardwood flooring) from old coconut tree which not bear fruits anymore and should replanted. Please check my web http://www.coconutfloorings.com for further details. I recently wrote an article on the benefits of coconut, specifically coconut oil, as well. Many people are not are of it’s “magical properties”. It’s a bummer that for so long coconuts and coconut oil, although incredibly nutritious, have gotten a bad rap due to the saturated fat content. I am glad that a new light is being shed on the topic and more people are becoming aware. I also love coconut! Coconut water is a great drink anytime of the year. But getting to the water is a real workout for me. 2) how do they get the canned coconut milks to be so thick? it just seems so creamy.. are the using young or mature coconuts? and i guess very little water? Is it good, or at least ok, to eat one fresh coconut a day (water and flesh)? I am trying to go primal but I do not want to be overdoing on the fats…. intended to treat or diagnose any medical problems. Hi Mark, I was wondering if you could clarify something for me. I was reading about mature coconuts and that they are high in calories/fat. Then I did some research on young coconuts to see if the young coconut was any different (w/ regards to nutrition)because it tasted a lot sweeter than compared to a mature coconut. A mature coconut has around 1400 calories composed mostly of fat, around 90%. While a young coconut has only 140 calories 30 carbs and only 3 grams of fat. So I was wondering in regards to nutrition should us primal eaters be more careful of eating the young coconut vs. the mature one because of the young coconuts higher carb amount (w/out any fat to slow down the absorption of glucose). It seems that because of the young coconuts low fat to higher carb ratio the sugar entering the blood stream would create a spike in insulin when compared to the more caloric/fatter/denser mature coconut. I am asking because I am a type one diabetic and whenever I have a mature coconut my sugar stays constant after that. But when I tried a young coconut my sugar spiked from 135 to 295(way above normal). Woudn’t this be of concern for someone who is trying to lose weight b/c increase in insulin=increase in fat? After seeing me drink coconut milk and water and using coconut oil on just about everything, my dad bought me a coconut! Depending on how well your food processor/blender works, adding a little coconut oil might really help. I had to add a little to mine. The problem was that the shredded coconut I used started clinging to the sides, and no matter how much I scraped it down, about 2 seconds after running the processor again, the entire mixture would stick to the sides again, and none of it got processed. Adding more shredded coconut just made the processor freeze. When I added the oil, it blended, but it didn’t blend the shredded coconut anymore, hence the remaining mealy/grainy texture. I have tried making almond butter before, though, and that didn’t work, so maybe it’s not the coconut, but just the appliance(s) I’m using. Coconut oil IS good for high heat. Better than all other oils. Check Sally Fallon and Mary Enig at Weston Price Foundation. All kinds of research, and it’s real, not paid for by someone who is interested in skewing results. For a richer coconut milk try squeezing the shredded coconut meat without adding any water. You’re going to need strong hands or a juicer, but the result is worth it. I was going to leave a thoughts on your blog, then changed my mind. Don’t you mind everyone wanting to know what topic theme it is? Will it be custom-made? I Appreciate It in advance, Felix. I adore the style of your theme. You mind sharing the specific themeyou are using? Thanks tons, Joanne. You make the point about how the term “nut” is extended to many foods that aren’t nuts in a strict sense, but coconut is a perfect example of that! Coconuts are NOT nuts! Tried cracking open my first young coconut today. Not as easy as the video shows…hubby had to pull out a saw! But we got it open. Now for my next question – it’s way too much water for one sitting and I can’t just drain it out because there is too much stuff around where we cut it open (maybe from the saw…made some weird sawdust). Can I leave it sitting in the fridge like that for a day or two? I tried the pudding and it didn’t thicken. I’ve got some in the freezer now to see if it cools. I did add a 1/2 tsp vanilla and a tbsp of cocoa and the flavor is phenomenal. It’s like coconut hot chocolate. Just… not pudding. Can you specify the amount of coconut milk? How much in the cans you’re using? Check out my Caribbean Curry Coconut Tuna recipe. This is my Primal cooking blog, I frequently add new step by step recipes with pictures. Hope you try some out. It is the best time to make some plans for the long run and it’s time to be happy. I’ve learn this publish and if I could I want to suggest you few attention-grabbing things or advice. Perhaps you can write next articles regarding this article. I want to read more things about it! 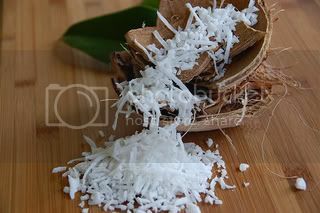 I read today that shredded coconut is highly inflammatory! Please tell me it ain’t so! This made me laugh so hard I had a hard time reading further. A warning: After hearing so much about the benefits of coconut oil for the past few years, I finally bought a small jar about a week ago (Nutiva, which is considered a very good brand, organic, cold-pressed, etc). Not wanting everything I cook to be coconut-flavored, I began melting about a level teaspoonful in my tea every morning instead. Coincidentally, my bowels have been a bit loose for the past week, and the only thing I’m doing differently is melting the coconut oil in my tea. Hmmm…. Maybe it isn’t for everyone. Or maybe it needs to be consumed with food rather than eaten straight or mixed with a liquid. What about the phytic acid in coconut? Shouldn’t that be a concern despite all the health benefits listed above?